Russian President Vladimir Putin has announced the start of the Russian leg of the record-breaking Olympic torch relay for the 2014 Sochi Winter Olympics. 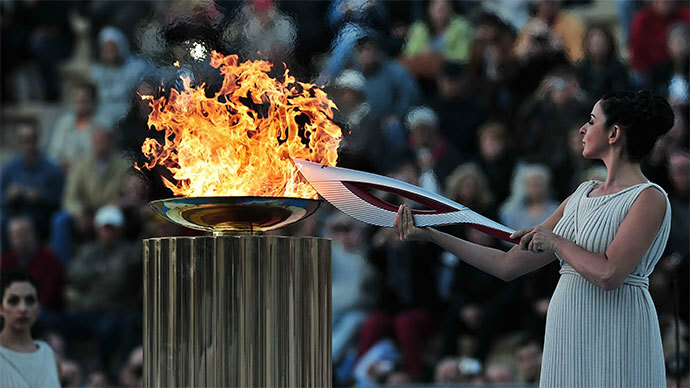 The relay kicked off at Moscow’s Red Square, where the flame arrived on Sunday. The first people to carry the torch around Kremlin were aspiring Russian ice-skaters Lina Fyodorova, 16, of Moscow and Maksim Miroshkin, 19, of Ekaterinburg. The pair won silver medals at the 2012 Junior Olympics in Innsbruck, Austria, and took first place at the 2013 Russian skating championships. 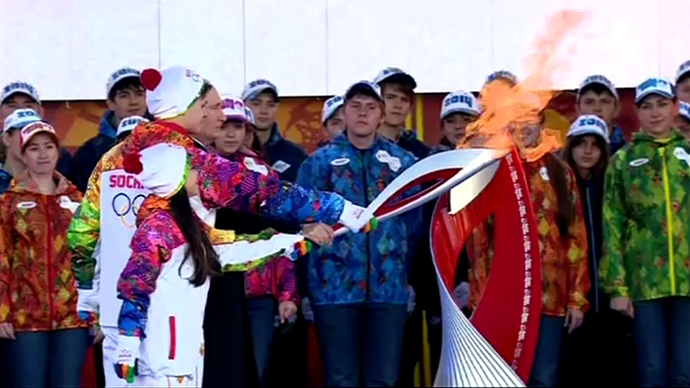 Russian bobsleigh racer, Irina Skvortsova, was also among the torch bearers. Skvortsova, who has undergone several dozen operations following a high speed collision incident in Germany, threw off her crutch to proudly carry the Olympic flame. In his speech at the torch relay ceremony, the Russian President said the Olympic flame would travel through all regions of country, and “will show Russia to the world as it really is, as the one we all love.” Russia’s scale, unique character and beauty, including its natural and cultural wealth, will be on full display during the relay, Putin said. The President added he was sure the Olympic flame will “light the hearts of millions of people, and the Olympic torch, designed in the shape of a feather of the magic firebird, will bring luck and joy” to the multicultural society of Russia. At one point during the Olympic torch’s Kremlin run the audience gasped as strong wind apparently put the flame off. However, the torch was promptly relit with the help of a security guard. 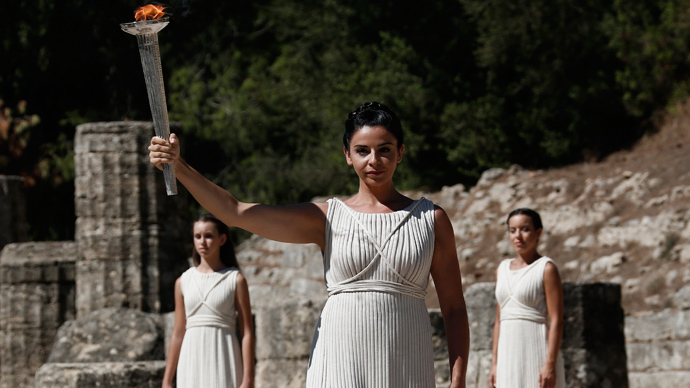 The chairman of the Sochi Organizing Committee, Dmitry Chernyshenko, has later assured that at every stage of the Olympic flame's 123-day trip across Russia the relay participants will light their torches from the original, authentic flame which was lit in the ancient Greek city of Olympia and delivered from Athens on Sunday. The organizers have 30 backup lanterns containing the Olympic flame, so “there will not be any problem,” he added. The Olympic flame was lit in Athens exactly 7 days ago. The flame was flown in from Greece in two small lanterns and arrived in Moscow earlier Sunday to the welcome of a guard of rifle-bearing soldiers. "Today can truly be called a historic day for us," Deputy Prime Minister Dmitry Kozak, who headed the delegation to Greece, said upon arrival. "We – all Russians – have a right to be proud”. It’s been 33 years since the flame lit in Athens was in Russia – then the Soviet Union – for the Summer Games [Moscow 1980]. The rare event will make it a very special moment for every single person carrying the torch – and it will pass through thousands of hands as it goes across the country. Among the lucky first ones to welcome the Olympic flame on Russian soil are bikers who are accompanying the torch all the way from the airport to the center of Moscow. The leader of the Night Wolves biker club, Aleksandr 'Surgeon' Zaldostanov shared his feelings about it with RT. 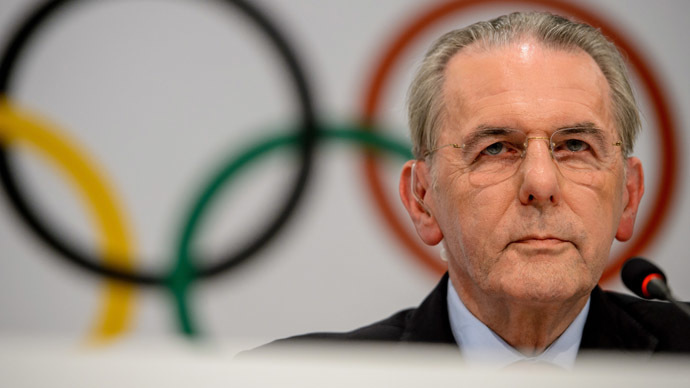 “The last time the Olympic flame was in Russia was a long time ago and we don’t know when the next time will be that it will arrive here, so the fact that we, the “Night wolves” are going to convoy the Olympic flame is a very honorable mission. There will be many people with major sporting achievements among us, one of the bikers is a very famous Russian sportsman, Olympic champion and a trainer of the Russian national team,” the Night Wolves leader said. The record-breaking 65,000 km long relay across the biggest country in the world will see the flame go through 83 Russian regions, 2,900 towns and settlements before it reaches its final destination in the city of Sochi at the brand-new Olympic stadium on the Black Sea resort on February 7, 2014. Before it gets there, it will be taken all the way up Mount Elbrus, the highest peak in Europe. We will also see it dive to the bottom of Lake Baikal – the oldest and the deepest lake in the world. 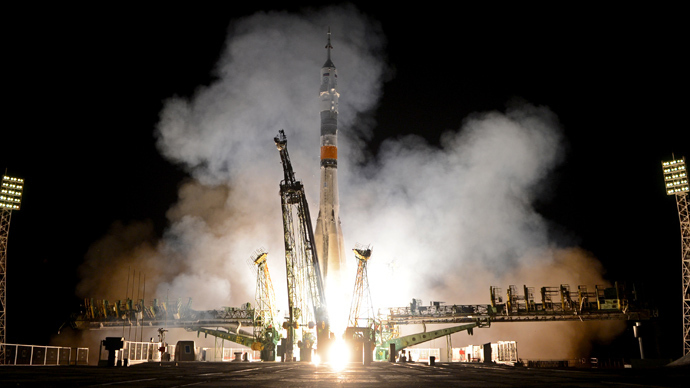 We’ll even watch it blast into space on board the Russian Soyuz rocket. As Dmitry Kozak said, it will shed light on a lot of what Russia has to offer. The Olympic torch was kindled by the sun’s rays on September 29 during a spectacular ceremony in the ancient Greek city of Olympia. 250 torchbearers then carried the flame 2,000 kilometers through 33 towns and 23 regions of Greece. Following the six-day Greek leg of the relay, the flame was presented on October 5 to the Russian delegation at Athens’ Panathenaic Stadium, which hosted the first modern Olympic Games in 1896. The Russian part of the relay will last 123 days. 14,000 torchbearers are expected to take the flame to the newly-built Olympic Stadium at the Black Sea resort of Sochi, where the opening ceremony of the 22nd Winter Olympic Games will be held. The first 10 torchbearers for Russia were carefully chosen and don’t just number renowned athletes. Some of them are national heroes, life-savers and rescuers. They come from various cities and are of different ages and backgrounds. One of them is the legendary Shavarsh Karapetyan, seventeen-times world champion in diving and also a hero who has saved dozens of lives. In 1974 he was one of the passengers on an out-of-control bus. The driver had got out of the vehicle which then started to move down a slope of a mountain. Shavarsh reacted very quickly - he broke the glass separating the driver’s cabin from the rest of the bus and took control of the vehicle, which helped prevent a catastrophe. In September 1976 was witness to a trolleybus falling into Yerevan Lake. Shavarsh jumped into the water and, at a depth of 10 meters with zero visibility, he broke the rear window of the bus and managed to save 20 out of 92 passengers. Doctors, who were treating the rescued, could not believe they were all taken out of water by a single man. Another torchbearer from the top ten is Daniil Kharitonov, a fourteen-year old pianist. He was born in Yuzhno-Sakhalinsk in the Russian Far East. By the age of seven, Daniil had won the grand-prix at an international competition in Vienna and the honorary title of “Mozart Wunderkind”. To date, the young pianist has been a prize-winner at several international competitions and has toured numerous countries of the world to great acclaim. Another on the torchbearer list is Diana Vishnyova, an internationally acclaimed ballet dancer from Saint Petersburg. At the beginning of her career, in 1994, she won the International Young Ballet Dancers’ Competition in Lausanne, where she took both the Gold Medal and the Grand Prix. This double victory has so far never been repeated by any other competitor.